It might not be as tricky to ink a deal with Odd Future Wolf Gang Kill Them All as we once thought. While earlier this morning (March 1) it was revealed through sketch comedy that the L.A. outsider hip-hop gang won't just sign with any old label that waves a contract in their face, it seems the underground act's members haven't pooh-poohed their options either. 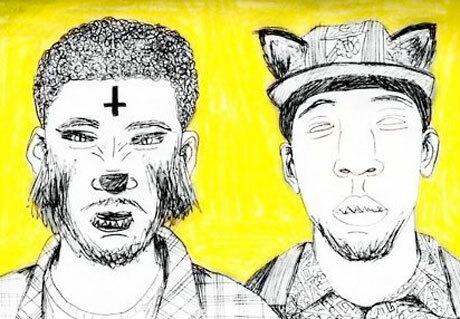 Earlier this year, the group's Tyler, the Creator signed on with celebrated imprint XL and now fellow Odd Future members MellowHype have been brought into the Fat Possum family. The duo of rapper Hodgy Beats and producer Left Brain dropped their sophomore album BlackenedWhite on Halloween last year, and apparently it impressed the heads at Fat Possum so much that the label is ready to repackage the product for a proper release. While the set was originally released as a free download on the Odd Future page, a post on the Fat Possum site explains that the album will be remixed and remastered for an upcoming summer re-release. The physical release will be put out on CD and vinyl and will feature bonus content, though so far there is no word on what that content will be. And, sorry, there's no firm release date at this point either.